A Symposium with Gil Z. Hochberg (UCLA), Rebecca Stein (Duke University). Moderated and with responses by Todd Presner (UCLA) and Kerri Steinberg (Otis College of Design). Please note updated event date. Featuring Gil Hochberg (Professor of Comparative Literature and Affiliated Faculty in Jewish Studies, UCLA) in conversation with Rebecca Stein (Associate Professor of Anthropology and affiliated faculty in Jewish Studies, Duke University), this event will put two recent books in dialogue with each other to examine a range of artistic practices, films, digital media technologies, and architectural responses addressing the Israeli-Palestinian conflict: Visual Occupations: Violence and Visibility in a Conflict Zone (Duke University Press, 2015) and Digital Militarism: Israel’s Occupation in a Social Media Age (Stanford University Press, 2015). 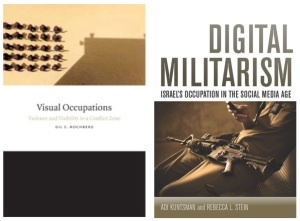 Combining ethnographic research in Israel and the West Bank, both books interrogate the role of visuality in the Israeli-Palestinian conflict, examining what is seen and what is not seen, what is visible and what is rendered invisible. How do processes of digitization affect the power relationship between Israelis and Palestinians; soldiers and citizens; eyewitnesses on the ground and distant witnesses abroad? When all the participants in this ever-globalizing, political playing field carry smartphones and employ social media, the conflict is visible as never before, often in real time, and in unexpected ways. These books consider the varying ways in which the digital age has both changed the political theater and engendered a wide-range of creative, artistic responses to the conflict. E-mail cjsrsvp@humnet.ucla.edu or call (310) 267-5327 to register. Cost : While the event is free and open to the public, pre-registration is required. Sponsor(s): , Sponsored by the UCLA Alan D. Leve Center for Jewish Studies. Funding Provided by the NEH Endowment in Jewish Civilization. Cosponsored by UCLA's Dept. of History, Center for Near Eastern Studies, Digital Humanities Program, Dept. of Comparative Literature.